It's Two O'Clock: Do You Know Where Your "Pope" Is? With apologizes to the longtime "Its ten o'clock, do you know where your children are?" announcement that began running in the New York City television market in the 1970s on the then named WNEW-TV, Channel Five, prior to the ten o'clock news, I ask the following: It's two o'clock, do you know where your 'pope' is? Yes, it's two o'clock in the afternoon, Eastern Standard Time and eight o'clock in the evening, Rome time, on Thursday, February 28, 2013, Thursday in the Second Sunday of Lent. Joseph Ratzinger has now begun to live out his new fantasy as the first-ever "pope emeritus," "His Holiness, Benedict XVI, Pope Emeritus." 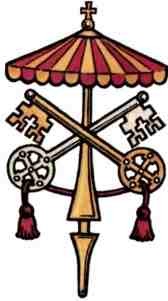 This is one time when all Catholics, no matter where they might fall on the vast expanse of the ecclesiastical divide at other times, are sedevacantists now, and they will be sedevacantists until the upcoming conclave of conciliar "cardinals" completes their auditions to be the next universal public face of apostasy. Numerous articles on this site have been written in the past seventeen days leading up the Joseph Ratzinger's new fantasy life in the Conciliarland Amusement Park. There is no need to repeat here what has been discussed in: Mister Asteroid Is Looking Pretty Good Right About Now, Living In Fantasyland To The Very End, part one, Living In Fantasyland To The Very End, part two, Living In Fantasyland To The Very End, part three, Living In Fantasyland To The Very End, part four, Whittling Away At The Last Catholic Bastion, Victim Of His Own Obliviousness, Red China: Still A Workshop For The New Ecclesiology (revised from 2009), Auditioning To Be The Next Universal Face of Apostasy and Coming Soon: The Two-Headed "Pope" Monster. With the possible exception of two or three Uniat Rite conciliar "cardinals," none of the "cardinal"-electors who have gathered to select the new universal public face of apostasy are true bishops. Each of the Western "cardinal"-electors who are sixty-four years of age and younger are not true priests, which means that there is a possibility, perhaps even a strong possibility, that the next conciliar "pope" will be a layman after the pattern of a Protestant minister. The next conciliar "pope" will continue to promote the apostasies, sacrileges and blasphemies of conciliarism. True popes do not give us doctrine that is ambiguous or that contradicts the defined teaching and constant tradition of the Catholic Church. True popes do not invent novelties to institutionalize as "new traditions." True popes do not pray with leaders of false religions. True popes do not visit temples of false worship. True popes do not attempt to give "joint blessings" with clergy of the Orthodox churches or the "ministers" of Protestant sects. True popes to not reaffirm adherents of false religions as being "believers" who can contribute to the fight against irreligion in the world. True popes do not twist the words of Sacred Scripture or the Fathers or Doctors of the Church to make them witnesses in behalf of conciliarism. True popes do not seek to canonize those who distinguished themselves as being enemies of the Divine Redeemer, Our Blessed Lord and Saviour Jesus Christ and thus of the souls He redeemed by the shedding of every single drop of His Most Precious Blood on the wood of the Holy Cross. True popes do not seek to make fools of our their predecessors by endorsing the very propositions that they had condemned. To wit, consider the fact that Pope Saint Pius X wrote the following in Vehementer Nos, February 11, 1906 "Hence the Roman Pontiffs have never ceased, as circumstances required, to refute and condemn the doctrine of the separation of Church and State." The Catholic Church is as pure and spotless in her doctrine and liturgy as the Most Blessed Mother is in her complete and perpetual integrity of body, mind and soul. The Catholic Church can never give us a liturgy that is an incentive to impiety. The Catholic Church can never promulgate any kind of liturgical rite that does not signify with exactitude what the sacrament means to convey. The Catholic Church is the one and sole Church of Our Blessed Lord and Saviour Jesus Christ. Mind you, this is not an exclusive listing. This is just a reminder that everything that will be happening in the next few days is as much as a sideshow as electoral politics in the United States of America or elsewhere in the world. In other words, it is farce. There is farce in the Protestant-Judeo-Masonic world of naturalism. There is farce in Protestant-Judeo-Masonic world of conciliarism, which is what I treated it with farce two days ago in Auditioning To Be The Next Universal Face of Apostasy. The events of the new few days and weeks in Rome are those of a false church, one that is the counterfeit ape of the Catholic Church. Do not permit yourself to be deceived by the appearance to the contrary. Significantly, though, I want to close this skeletal outline of an article by reminding you that Joseph Ratzinger/Benedict XVI rarely--and one can probably count the number of times on the fingers of two hands, if that--mentioned Our Lady's Most Holy Rosary, no less the necessity of doing so in order to merit God's favor and to gain Heaven. His mentions of the very Rosary given to Saint Dominic de Guzman, the founder of the Order of Preachers, by Our Lady to be our weapon against heresy and the enemies of Holy Mother Church and the good of our immortal souls have been perfunctory and pro forma. This is quite in contrast to the wonderful, eloquent and moving encyclical letters about the Holy Rosary written by Pope Leo XIII. That, in addition to Joseph Ratzinger having long been a key instrument in the deconstruction and misrepresentation of Our Lady's Fatima Message, Heaven's very peace plan, going so far as to express disbelief in the actual physicality of her apparitions in the Cova da Iria near Fatima, Portugal, should tell you all you need to know. No Christ the King? No Rosary? No Good Cause. This is as true of conciliarism as it is of naturalism in the world. The Immaculate Heart of Mary will triumph in the end. Saint Gabriel of the Seven Sorrows, pray for us.